Kirkstead was founded in 1139 by Hugh Brito (son of Eudo), lord of Tattershall. Hugh greatly admired the manner of life at Fountains and received permission to obtain a colony of monks to provide for a new settlement on his own lands. It was one of the first daughter-houses to be colonised by Fountains. The site was on a level plain surrounded by brushwood and marsh, on the east side of the Witham valley. In time, this site proved to be too small for the community and in 1187 the monks were granted leave to move to a new location. The community prospered at its new site and there was a large number of monks and lay-brothers in the thirteenth century. 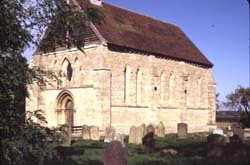 Like most of the Cistercian abbeys of England, Kirkstead suffered heavy losses during the fourteenth century. Despite financial troubles the abbey was still reckoned to be among the greater monasteries of Lincolnshire. The first two abbots were members of the group of dissident monks that left the Benedictine abbey of St. Marys, in 1132, hoping for a return to the letter of St. Benedicts Rule. (1) They thus brought to the foundation at Kirkstead the best traditions of the Order and a rigorous approach to monastic life. However, the house had an unhappy ending. Kirkstead was suppressed in 1537 after the abbot and three of his monks were implicated in the Lincolnshire rebellion. Following the uprising they were arrested, tried, and on 6 March 1537 condemned to death. (2) At the time of the Dissolution the annual net income of the abbey was valued at £286. (3) Thereafter the roof of the abbey was stripped for lead and the buildings were left to ruin.